I’ve discussed how David Gay’s strtod() function computes an initial floating-point approximation and then uses a loop to check and correct it, but I have not discussed how the correction is made. That is the last piece of the strtod() puzzle, and I will cover it in this article. When that inequality fails to hold, the approximation needs adjusting. How Much Do You Adjust the Approximation By? strtod()’s mission is to adjust b so that it becomes the correctly rounded result r, that is, the closest double-precision floating-point number to d. It does this by computing the distance between d and b and then adding that to b (the distance is negative when d < b). To compute the distance, strtod() first computes the number of ULPs between d and b. (In this context a ULP is the relative distance between two floating-point numbers; for example, adjacent floating-point numbers differ by one ULP.) 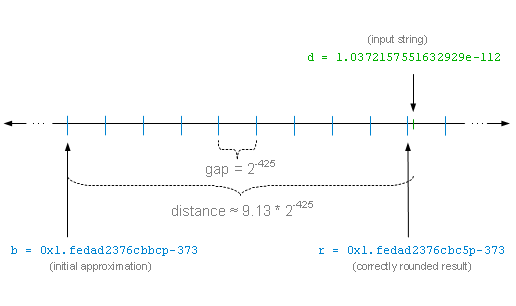 The distance is the number of ULPs times the size of the gap between floating-point numbers around b. The information strtod() needs to calculate the number of ULPs lies in the big integer variables dS, bS, and hS: d is (dS – bS)/hS half-ULPs away from b, which divided by two gives the number of ULPs. strtod() creates two floating-point integers: one that approximates dS – bS, and another that approximates hS. Since strtod() stores big integers in pure binary form, this is easily done: the significant bits are set to the first 53 bits of the big integer (no rounding is done), and the power of two exponent is set to the big integer’s length in bits, minus one. Actually, what strtod() does for the exponents is this: based on the length of the two big integers, it computes their common power of two factor, which it then removes before setting their floating-point exponents. These smaller — yet proportional — floating-point integers are then divided using IEEE floating-point division. strtod() performs this calculation in its b2d() and ratio() functions. It manipulates the big integer and floating-point values in their raw binary forms. which as a hexadecimal floating-point constant is 0x1.fedad2376cbbcp-373. That is the difference in half-ULPs, so we divide it by two to get approximately 9.1277748270577888 ULPs. The amount strtod() adds to b to get r is the number of ULPs times the size of the gap between floating-point numbers around b. In this example, the gap size is 2-425, which is the place value of the 53rd bit position of b (which is 1/252 of the place value of the first bit position, 2-373). Therefore, the adjustment is approximately 9.13 x 2-425. Due to rounding, adding this is the same as adding 9 x 2-425 — 9 ULPs. The fractional part of the adjustment is used as a stopping test. If it is “close” to 0.5, the loop must continue, since we can’t say for sure which side of 0.5 we’re on. In this example, the loop ends because the fractional part is not close to 0.5. When the distance between d and b is less than one ULP, the adjustment is set to (plus or minus) one ULP. This works because, to get to this adjustment phase, big integer arithmetic has already determined conclusively that d and b are more than one-half ULP apart. In other words, b must be altered by one ULP. d and b could cross a power of two boundary, but there’s no need to check for this. The adjustment calculation is independent of gap size (gap size cancels out). The adjustment calculation is not done in cases where “bigcomp” applies (bigcomp applies only when the truncated value of d is within one-half ULP above b). strtod() has to handle overflow and underflow when adjusting approximations near DBL_MAX or 2-1074 (the smallest double), respectively. The maximum adjustment is 10 ULPs or so. Java’s decimal to floating-point conversion routine, the doubleValue() method of its FloatingDecimal class, takes a simpler — but less efficient — approach. Instead of doing the above calculation, it simply adjusts its approximation by one ULP and continues to loop.